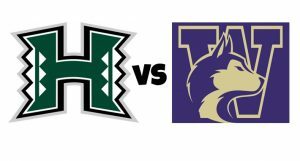 Nextarrow_forward 2019 UH Road Warriors-Huskies Football Weekender 1 ROOMS LEFT! Our hale for this football weekender is at the Grand Hyatt Seattle, the perfect spot for exploring downtown Seattle. Just a short walk from great shopping and restaurants. Round trip air via Alaska Airlines from Honolulu. Baggage fees are additional and payable directly to Alaska Airlines at check-in. Current fees are $30 for the 1st bag and $40 for 2nd bag. Additional bags are $100 each. Weigh limitation per bag is 50 lbs. Checked bag fees are a one-way fee. Starting from $1,495 per person quad occupancy (4 persons sharing existing bedding). Starting from $1,595 per person triple occupancy (3 persons sharing existing bedding). Starting from $2,195 single occupancy. 09/11/19 – Depart Honolulu on Alaska Airlines flight 818 at 9:30 pm and arrives in Seattle at 6:29 am, 9/12. 09/16/19 – Depart Seattle on Alaska Airlines flight 853 at 6:00 pm and arrive Honolulu at 9:08 pm. (same day).